Will there be a kicker competition in Green Bay Packers‘ training camp this year? Monday, the Packers claimed placekicker Sam Ficken off waivers from the Seattle Seahawks, who cut him over the weekend. 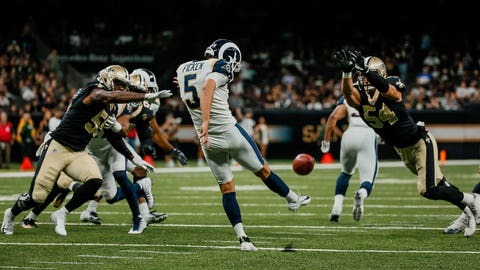 Ficken has appeared in four games for the Los Angeles Rams over the past two seasons, making just 3 of 6 field-goal attempts and 14 of 15 extra-point attempts. Ficken signed a futures contract with Seattle in January before being waived Saturday. An undrafted free agent out of Penn State, Ficken has also been in training camps with Jacksonville and Kansas City. Mason Crosby has been the Packers’ kicker since 2007. Last season he made 30 of 37 (81.1%) field-goal attempts and 34 of 36 extra-point attempts. In his career, Crosby has made 80.4% of his field-goal attempts. The last time Crosby had competition in training camp was 2013, when he beat out Giorgio Tavecchio.